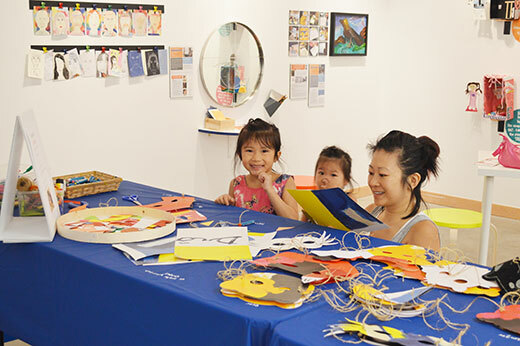 The weekend of June 20-21 was full of activities celebrating aboriginal culture at the ArtStarts Gallery. 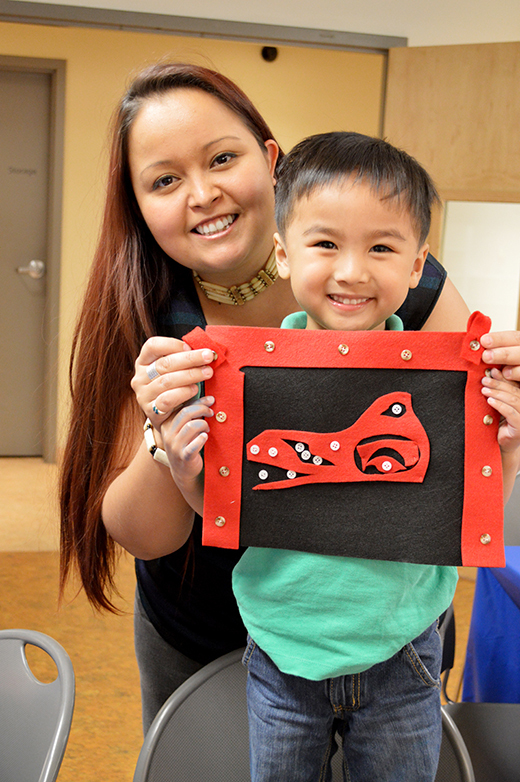 On Saturday we were excited to host our Vancouver Draw Down event and on Sunday we joined the National Aboriginal Day celebrations. We were happy to welcome artists Anastasia Hendry and Christine Mackenzie, who facilitated an engaging workshop called Draw and Tell: Northwest Coast Storytelling. 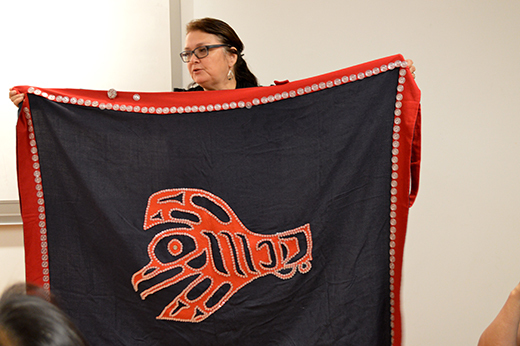 After beginning the session with an acknowledgement of First Nations people and their territory, Anastasia introduced her practice as a Haida textile artist. Christine also shared with us her practice and her Kwakuitl ancestry. 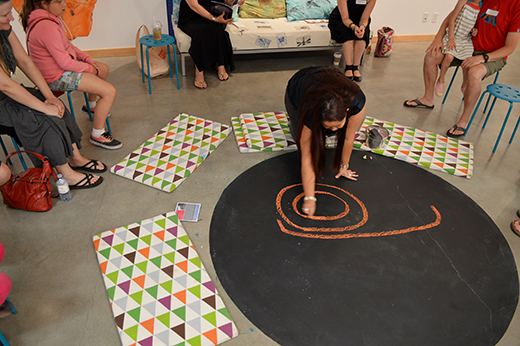 As Anastasia narrated portions of the story of Lelou, a young man who explores and finds unexpected help on his treacherous journey, Christine drew on our gallery chalk circle elements that represented that particular moment. Participants were slowly guessing the animal represented by the artist in the traditional style of formline drawing — and with surprise they discovered it was a wolf! 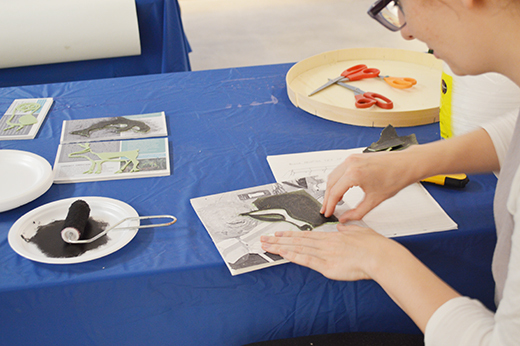 Soon after the artist finished the storytelling component of the workshop, participants moved into the ArtStarts Lab space to learn more about First Nations cultural traditions and art forms. As well as a deerskin apron and other fascinating artifacts, Anastasia showed the group a button blanket that her grandmother made for her that represents her killer whale crest. This provided a good context for participants to start making their own button blanket representing Lelou the wolf in the story. 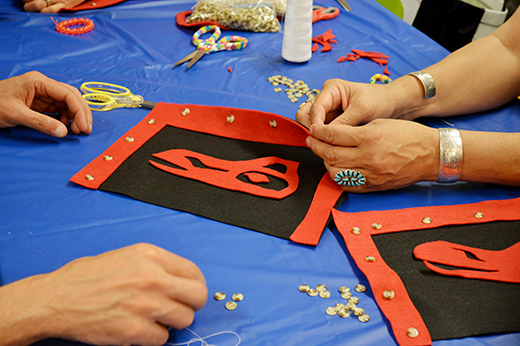 Once the red and black felt pieces were assembled, all participants, big and small, were focused on attaching buttons to the piece. This was the first time some of the young participants held thread and needle in their hands. Some parents event manifested how valuable was this session to not only to provide important learning on ancestral culture, but also an opportunity to discover important life skills like sewing. 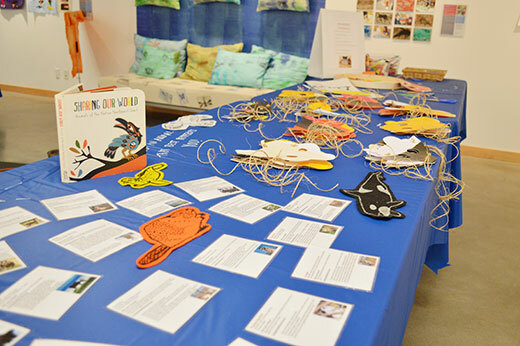 On Sunday we also celebrated and learned about Aboriginal traditions in art. 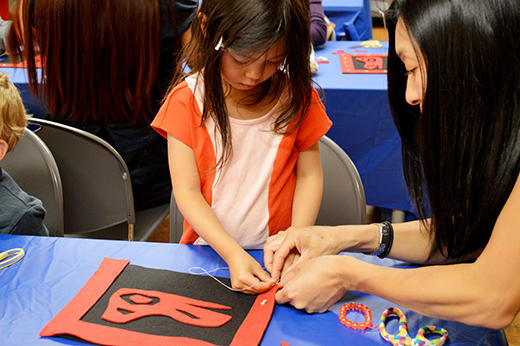 After exploring some of the local animals of British Columbia, participants conntected with their inner animals and created animal masks. 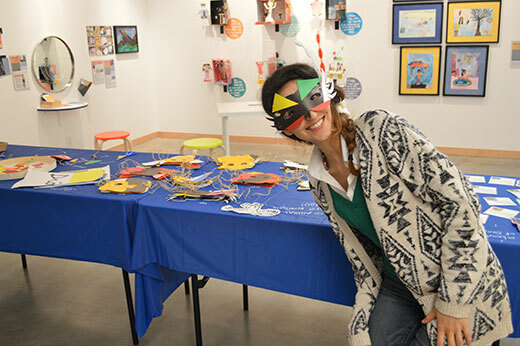 Using construction paper, pipe cleaners, pastels and creativity, we howled, growled and soared through the gallery. 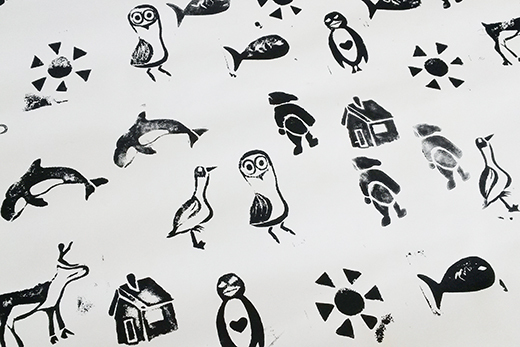 We also got to learn printmaking techniques and created a collective piece to inspired by traditional Inuit block printing. 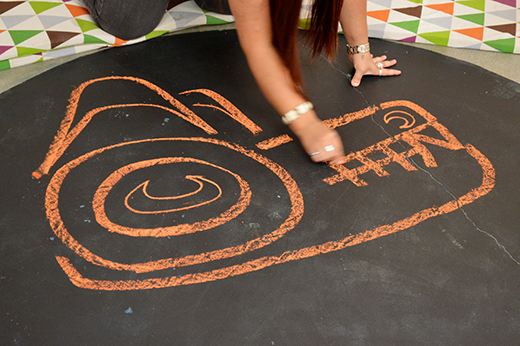 With animals, houses and people, stories were told and shared in our community print. Check out more event photos on Facebook! 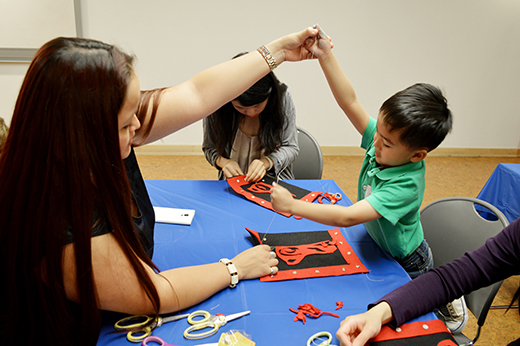 Stop by the ArtStarts Gallery on Wednesday, July 1 for Canada Day and contribute your cultural colours to our community Heritage Loom. 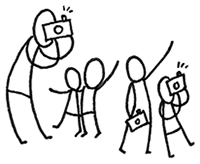 Also be sure to join us at many more free arts events for families!